Building Cluster Groups - What's Involved? Everything we do requires effort. Effort from ourselves and our own businesses is not unique. We all know that marketing ourselves can be trumped by marketing of friends and associates. Making HARD associates and INVOLVED friends lifts us UP and people take those references more serious when searching for services and/or products. Compiling a set of "rules of thumb" would be the best (better together) approach so all members of any cluster group know what to expect of and from each other. Setting down a number of 4 is not set in stone and it shouldn't be. 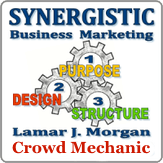 If you have a business/person who would benefit your group by all means include them. Don't get TOO big though as that defeats the purpose of any group being 'manageable' in the long term. A group of two is too small as that turns into 'reciprocal' by the search engines and that won't work in the long term either. If a minimum is 3 and a maximum is 5-7 we still think the perfect 'magic' number is 4. So we'll refer to all cluster groups as 4 here after. However your group may work best with a different number. AND that is entirely up to you and your friends/associates. The 4 people who form a cluster group need to help each in more ways than just putting advertisements online. Here are some areas where you can help each other learn more about business online. Help your cluster-mates learn social media platforms they are not familiar with. Use a service like StartMeeting.com, Skype or Google+ Hangouts to communicate on a regular basis. Once weekly if possible. Send your ideas in writing by email to all your cluster-mates and agree on who does what and when. <--- important. Link from your website to all your cluster-mates websites even if they are not the same type of business. Choose your cluster-mates carefully - personality clashes won't work when you have to work closely together. GIVE freely and TRUST completely. Perhaps these two items need to be number ONE on this list as being generous with your knowledge and trusting all your cluster-mates is an absolute must. You need to understand that some businesses (as in consulting) where you receive knowledge that others need to pay for, should be kept confidential. IF your cluster-mate freely shares knowledge to help you and you spread it around, YOU HAVE BROKEN the trust. This is NOT your knowledge to share. The trust issue is the most important issue you must understand and understand fully. If you are not trustworthy, then being a part of a team may not be the best choice for you. Can I be in more than one Cluster Group? Absolutely - how much time do you have? Forming and joining groups is what social media online is all about. We cannot be an island and still have people who will shout out good news about who we are and what we do. Caveat - time is money and if you over-extend yourself you may be volunteering too much. You can get to know people by communication ---> Feature Friday Conference Call and by joining the network group on Linkedin The 'Better Together' Approach. Form cluster groups by joining this Group ---> Facebook 'Better Together" Approach for Clusters and Clustering. Meet and great on calls based out of the Linkedin group and form clusters and help make 'rules' for clustering at the Facebook group. Naturally there will be overflow from one group to the other so joining both groups will give you a definite advantage. You don't want to miss any really good stuff! Lamar, can you help us keep track of our Clusters? Visit the Cluster Groups page (of this website) to see what's Movin' & Shakin' with individual Cluster Groups.